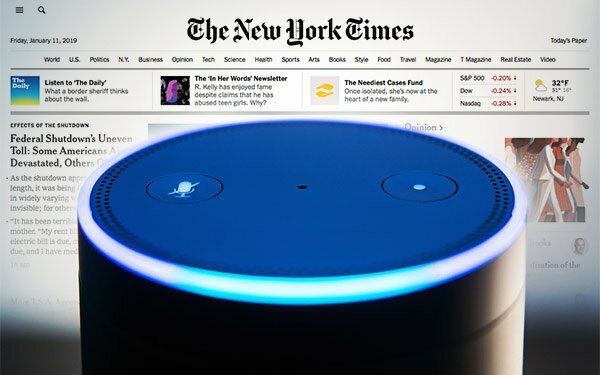 In a move to explore leveraging voice to reach current and new audiences, The New York Times launched a new endeavor that allow readers to access content through their Alexa-driven devices. On Sunday, January 13, the print edition features a series of prompts that readers can use to hear more coverage across travel, music and books. It includes a special section focused on the travel section’s annual list of “52 Places to Go,” music editor Caryn Ganz’s weekly roundup called “The Pop Music Roundup” and insight into what the paper’s book critics and editors are reading at The New York TimesBook Review. Each of these features will be ongoing and continue to evolve. The company’s move into voice opens up additional opportunities for collaborations with advertisers and sponsors. The Times’ branded content studio T Brand Studio will work with Audi to create a skill for Alexa-enabled devices, an inaugural venture for the publisher. 1 comment about "'NYT' Launches Voice-Activated Content, Audi Collaboration For Alexa-Driven Devices". PJ Lehrer from NYU, January 15, 2019 at 10:58 a.m.